Looking for a great bottle of wine for a special occasion, look no further than Du Vin Wine & Spirits. Du Vin Wine & Spirits is a destination shop where customers regularly visit from across the US, Europe and Asia. This gem has been located in the West Hollywood Design District for nearly 40 years! Just around the corner from Zinque, step into a quaint gold mine for some of the best wine selections in Los Angeles. The founder and proprietor of Du Vin Wine & Spirits, René Averseng, hails from France. His shop has remained in the same location for decades, housed in a turn of the 20th Century dwelling. 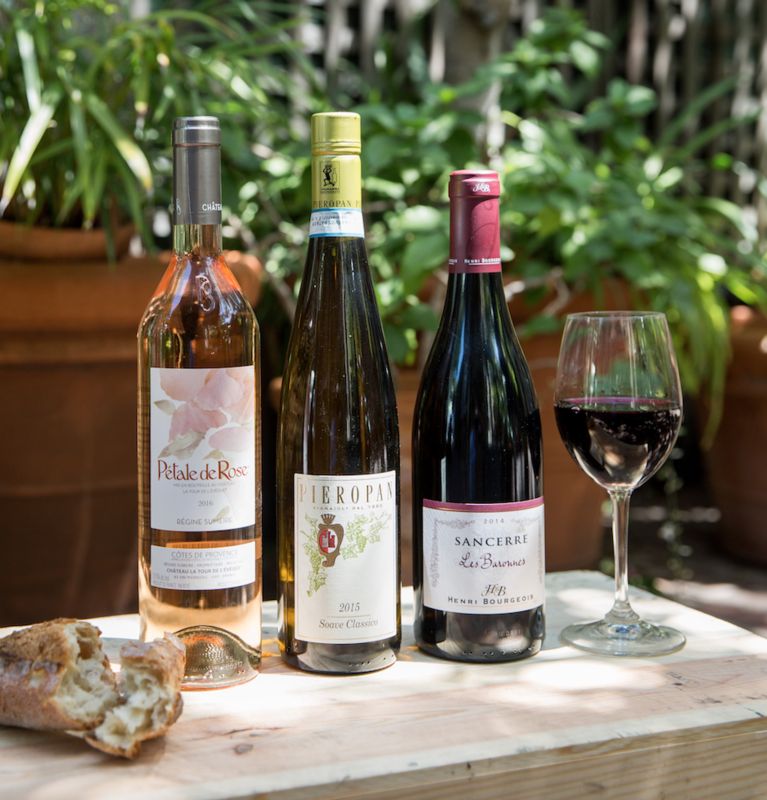 At Du Vin, prepare to escape to Europe while finding quality wines at reasonable prices. Enter down a brick driveway past the main residence and you will be greeted by an enclosed, secret garden, adorned with a fountain and luscious greenery. The windows of the shop are embellished with lace curtains, as glass doors welcome you to a fortress of wines from around the globe. Each section of the shop is denoted for it’s region: Champagne, Bordeaux, Italy, Spain, California. While browsing the wine bins, have yourself a locally roasted espresso, exclusively available at Du Vin. Du Vin is best known for its specialization in unique and hard-to-find European wines. While René sources the European wines, Du Vin’s fellow wine specialist, Robert, remains the California & Oregon authority. We touched base with René at his shop to gather his top recommendations for this time of year. Here are his selects of the best wines to drink as we transition from summer to fall in Southern California. Third generation winemaker Régine Sumeire, is one of the first female winemakers in Provence and the recipient of many accolades. She created “Pétale de Rosé,” made of two rosé cuvées, produced using a specific vinification process—unique in Provence—that results in a particularly pale “diaphanous” color of rosé. The taste is of raspberry (framboise), herbs and a crisp, lip-smacking finish. Chill down and drink this rosé when the sky turns the same color as the wine in your glass! From the Veneto, the Soave Classico region of Italy. This is hands-down the most famed version of this wine. Made primarily from the local grape, Garganega, this is a pale yellow-gold wine with aromas of lemon blossoms, lime zest, and the minerality of rocks. Once you taste, the mood changes to a citrusy custard. Finishes dry and crisp. Why should white and rosé wines have all the summer fun. From the area of France known for its romantic castles and estates comes this Red Wine ready to chill out your summer. This Pinot Noir has a luscious ruby color. Aromas of wild raspberry and Morello cherries, red fruits, rounded with soft tannins from both the grape skins and oak barrels.